Everyone's favorite season is here again. No, not the holiday season - spoiler season! In this case, the first spoilers for Fate Reforged have been revealed, including seven Commons. While there are several new mechanics that caught my interest, today I wanted to take a quick look at the Manifest mechanic, particularly as it plays out in Ethereal Ambush. Manifest is an ability that has you take a card from another zone (typically your library), and play is face down on the battlefield as a 2/2 creature. If the card that you play is a creature, you can flip it face up for its mana cost at Instant speed. Interestingly enough, if it's a Morph card, you can also flip it face up for its Morph cost. But if it's not a creature card, the card will continue to be a 2/2 creature until it leaves the battlefield or the game ends. Now some might intrinsically dislike this ability. After all, the card that gets played face down might have been the one card in your deck that could let you win the game. It might be a powerful Instant or Sorcery, or a creature with a sweet enters-the-battlefield ability, or something or that nature. So rather than getting to play it, now it's relegated to a mediocre 2/2 creature. But in fact, Manifest plays out almost like a mill-type effect. At its worst, it is equivalent to: place the top card of your library into your graveyard, then put a 2/2 creature token onto the battlefield. In fact, it's actually better than that, because one of the best ways to get rid of tokens is to bounce them, and that won't permanently deal with a Manifest card. So with that out of the way, how good is Ethereal Ambush in Standard Pauper? For the sake of argument, imagine instead it was a 4/4 vanilla creature with Flash for 3GU. While you might prefer a 3/3 with evasion (aka Spire Monitor), this would be certainly be playable in the right deck. Now, instead make it an Instant that splits that 4/4 up into two 2/2 creature tokens, and you have a card that is arguably even better. The near equivalent to this, of course, is the powerful Flurry of Horns and Rise of Eagles, trading the french vanilla abilities for the upgrade from Sorcery to Instant speed. Of course, this does cost you two cards from your deck. 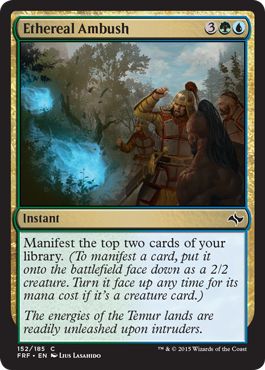 But unless Manifest leads you to empty your library, those extra two cards don't really matter anyway. At best, you've gained some interesting options for two creature cards; at worst, you've discarded two cards into your graveyard. Obviously the final value of this card will depend a lot on the metagame that surrounds it. But the ability to summon multiple creatures at Instant speed in Standard Pauper is nothing to be overlooked. I evaluate Ethereal Ambush as being playable at worst, and potentially very good in the right deck or circumstances.